Sucker Punch software engineer Chris Heidorn stopped by the PlayStation Blog today to discuss the trophies to unlock and stunts to perform in their upcoming superhero game inFamous. 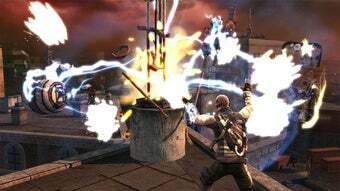 Chris goes into great detail about the stunts included in the game, which are sequences of events and combinations of powers used to kill the enemy creatively. Sucker Punch teamed with the Sony testing team to generate a list of more than 80 stunts, narrowing that down to a little over 20 using an "experience monitor" that measured the power used versus the damage done. Examples include the "Get off my cloud", which is received for knocking someone off a high building to their death. Once again, I find myself extremely glad that life has no achievement system.